So, I was having one of 'those' days yesterday. You know, the day where you are feeling perturbed for absolutely NO reason at all. I spoke to the hubby on the phone during the day and he gathered that I was in a 'mood' of sorts. Wooohooo for 30% off COUPONS! THIS ONE is 16% off and not only has oober amounts of great customer reviews, it's also eligible for FREE shipping. THIS ONE isn't on sale, but it's half the price and also has some nice reviews. Hope that helps! Found this cute pink LOVE graphic tee on sale for $2.49 in 12months, 18months and 3T. There are a TON more for the same price HERE . Just browse through. Lots on sale! And last, but not least...my girlfriend was just telling me about this FABULOUS deal over the weekend and then I got an email about the same thing from one of my readers, Robin. You won't find it on their website. Just ask customer service about it when you go to the store. Just wanted to let you know about Sears. If you join their Kid Advantage Program and purchase jeans *then you know the kiddos will have holes) you can return them and get a BRAND NEW PAIR FOR FREE (has to be same size and their brand)!! It has lasted me through 3 boys!! -Melt butter in a large skillet. -Sprinkle salt and pepper generously on both sides of chops. -Brown chops on both sides. -While chops are browning, wash the potatoes and slice into 1/4 inch. -Whisk together the soup, sour cream and milk. -Spray crock pot with PURE. -Layer potatoes slices, soup sauce and cheese chunks 2 or 3 times. -Lay pork chops on top. -Cook on low 4 hours. **My notes: I added some onion powder and extra pepper to the soup mixture. I thought it needed a little more flavor. Also, I had to put it on HIGH and it took me almost 4 hours for the potatoes to cook through. We LOVED this recipe!! Sooooo yummy!!! Thanks, Tamy! Do you like flowers or something else to be given to you as a surprise? If you haven't already, GO ENTER my current GIVEAWAY! I love the Reese's bouquet! I think I'll make one for my hubby! The pork chops look good too. I don't have a recipe like that. Thanks. PS - I love flowers! I don't know. I LOVE a good flower bouquet. But Reese's are just amazing. This is a great idea and like mari, I might make one for my hubby too! He absolutely loves Reese's...they are his favorite candy. Thanks for the great idea! I would rather be surprised by a piece of jewerly...I know I know...not expensive but even a charm for my bracelet. But, I would take flowers anyday and cherish them!!! Your hubby gets the "what a man" award. Great idea on his part. I love chocolate and coffee so that is the way to my heart. And my fav flower is Glads. I get them "from my hubby". I buy them and call him and say--"Hey guess what you just did". Don't bother me at all cause he laughs and says it was all in his heart. Our lover's joke. That's so sweet about your husband. Very creative (and delicious). The recipe looks great too - thanks! 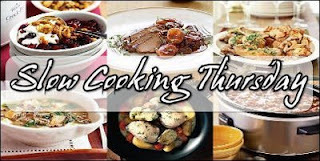 It's raining today, so I'm definitely in the mood for crock pot recipes. I love candy, so that'd be nice. But I always buy my own flowers for around the house...So when the husband does surprise me with them, its pretty awesome. that is so freakin cute! What a good thoughtful husband!! Love it! I do like flowers a lot! I actually still have some of the flowers from the first bouquet that Sidnei got me! They go into a scrapbook page :) Though I have yet to scrapbook them! Even though they just die, they are beautiful and I love them none the less! But, I would NEVER turn down a bouquet of chocolate! :) haha! I'm a flower freak and wish I got them a lot more often *sniffle*. Either one makes me happy. WHAT?! 65% off that waffle maker? OH YES I need it. :) thanks for the link! You're a lucky lady, he's a keeper! I'm totally with you, peanut butter cups make the world a better place. :) I do love getting pink roses though, they're my favorite. 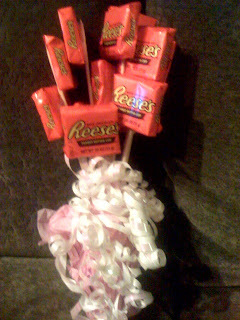 What a sweetie to make a Reece's bouquet!!! Very cute! :) Looking at it makes me hungry! Oh what a wonderful man you have there!! Makes me want a Reese's right now. Seriously - your hubby needs to start a blog for men to read. I love surprises, but don't really like flowers. Candy is best! Or even when the hubby fills up my car without me asking. ♥ What a sweet man!!! Your man is such a keeper! To be honest any unexpected gift is fun to receive. Reeses flowers?! That is the sweetest thing ever! Thanks for the can crusher deals. I think I will actually get that first one! QOTD - I like any sweet surprise. But, as for flowers, don't spend to much money on them. The little mixed bouquet from Walmart is fine with me! Holy smokes - is it already Thursday!? I used to like different surprises, but now I'm into the flower thing again, because usually it's my sons picking out the pinkest petals they can find to give to Mama. NOTHING is better, well, that Reese's thing is pretty cool. I do love the thought of your hubby creating his work of art in the parking lot. Reeses yum... I like flowers! What a sweet hubby! I will take a chocolate over roses anyday. could you please get your husband to talk to mr. magpie??? i'm dying! what a guy! and oi'm so buying that wafflemaker- thank you!!! Oh that is SO sweet! I'm jealous. Lately my husband gets me flowers--but that's far and few between :) I'd rather have your kind of bouquet than flowers but he'd never torture me like that! Reese's Peanut Butter Cup BOUQUET - TOOOOO cute!!!!!!! I dont' really like flowers so much - then I have to remember to water them, they get in the way on my counter - then they die and make a mess - then I have to clean the vase. (I think I complain too much) Anything that creates more work for me is not so much a wonderful surprise! You have such a wonderful guy. I agree with you, chocolate over flowers anyday!!! I also wanted to let you know that ShopKo also has the same deal on jeans too. Which is good, my little guys loves to burn out knees for the fun of it. Just go to customer service and find out the brand that they will replace on and stock up. Honestly, just about anything would be a nice surprise, but if given a choice, I wouldn't choose the flowers. Flowers die, but diamonds are forever! Wonderful SCT recipe! 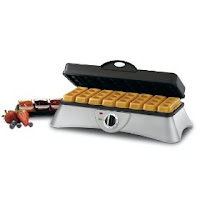 The sale price for the Quisinart waffle maker is fabulous. I'm going to hint to hubby tonight - lol. Have a wonderful week. Wow! Your husband is a sweetie!! And so creative!!! This slow cook recipe sounds so delish. I might have to make it next week. How SWEET of your hubby! That is a good man!! I'm pretty sure your hubby is the best one out there! Any man who makes me a reeces bouquet wins me over! Actually it's a really great gift idea, I think I'll do one for my friends bday. Flowers are fun sometimes but your Reese's bouquet is so sweet and personal! These are some great deals-thanks for sharing them and thanks for dropping by my blog as well. I really appreciate it! Flowers are wonderful, but my practical side says way spend alot of money on something that is going to die, if my hubby wants to spend $30 - $50 on something, get me a gift card or take me to Target! Makes my heart melt. What a sweet man! Nothing says love like chocolate and peanut butter wrapped in a bouquet! i too am a reese's freak! in fact, we just named our new baby girl, nola reese [yes, after as my son calls them..."my favorite"]...although, we also liked the name :) kuddos to your hubby!! Ohhhhhhhhhhh he is a keeper! Now CherryMashes on a stick would be better but you all might not have them in stores around ya. I'm glad you enjoyed it. Potatoes can be so pesky to cook!! Reese's bouquet. So sweet. YOu're very lucky of your hubby, cause not all hubbies are like that. Take good care of him.